It's never too early to reserve your trip! Launched in 1895, the Car Ferry #2 saw just over a decade of service to the Great Lakes before disaster struck taking six lives with her in the September 1906 event. During a storm, the Car Ferry was overtaken by a gale wind just three miles from the Calumet City Lighthouse near the entrance to Chicago Harbor. The large amount of water that had accumulated in her hold caused her to sway and list well beyond the safe range for the vessel. Despite efforts of two tugs to right her, she lurched and capsized completely over. 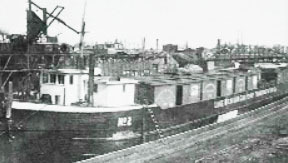 At the time of the disaster, the Car Ferry was hauling railroad cars, iron ore, and lumber. Despite her length of 300 feet, this wreck is at times hard to locate. Despite that, the Car Ferry #2 as it sits in 40 feet of water is a great shallow entry level wreck that is worth seeing and exploring. We visit the Car Ferry #2 from Hammond Marina.